Superman Batman Tome 2 est écrit par Loeb Jephavec un total de 336 pages et publié par Urban Comics le March 4, 2016. Superman/Batman Vol. 2 est écrit par Jeph Loebavec un total de 336 pages et publié par DC Comics le 2014-12-23. Absolute Superman/Batman Vol. 2 est écrit par Jeph Loebavec un total de 368 pages et publié par DC Comics le 2014-05-20. The World's Finest join forces in this reality-bending tale, Superman and Batman rule the Earth with an iron fist, with humanity bending to their will. Before long, the World's Finest Duo is sent careening through a series of bizarre alternate Earths, facing an assortment of classic DC characters including Darkseid, Lex Luthor, Superwoman, Kamandi, Sgt. Rock, Haunted Tank, and many more.Collects Superman/Batman issues #14-26. Extras include pencilled pages and character sketches. Superman/Batman, Vol. 2: Supergirl est écrit par Jeph Loebavec un total de 168 pages et publié par DC Comics le 2005-09-12. Superman and Batman work together to battle evil in many forms. Superman & Batman vs. Aliens & Predators 2 est écrit par avec un total de 48 pages et publié par DC Comics / Dark Horse le 2007. Superman Batman Vs Aliens Predators #2 (of 2) est écrit par Various Artists et publié par .DC Comics. Superman Batman VS Vampires Werewolves #2 Comic est écrit par Kevin VanHook et publié par DC Comics le 2008. Superman & Batman Magazine #2 (The Joker's Deadly Debut) est écrit par et publié par Welsh Publishing. Superman and Batman magazine. Issue #2. Fall 1993. Includes articles on The jokers deadly debut, tv's newest man of steel, the flash vs. gorilla grodd, super-hero pullout: the atom, superman doomsday and beyond, batman a night at the opera, lois and clark, the daily planet, hero file, photos and much, much more! Superman & Batman Vs Vampires & Werewolves Issues #1 & 2 est écrit par VanHook et publié par DC le 2008. Carlos Pacheco Absolute Superman/Batman Vol. 2 (Hardback) - Common est écrit par Carlos Pacheco and Ed McGuiness by Jeph Loeb et publié par DC Comics. Batman/Superman Vol. 2: Game Over (The New 52) est écrit par Greg Pakavec un total de 224 pages et publié par DC Comics le 2014-11-18. The Dark Knight and the Man of Steel uncover a plot by the Toymaster to use a secret, potentially deadly element in his new video game, the characters created by players manifest in real life. The ultimate fighting game results--and a world-wide network of players must team up to create the most powerful, skilled Super Heroes imaginable with one goal: To kill Batman. When Batman and Superman are corned by the Toymaster and Mongul, they are pitted against on another in a battle to the death, with their only hope being the The Worlds' Finest.Collects Batman/Superman #5-9, Batman/Superman Annual #1, Worlds' Finest #20-21. Batman/Superman Vol. 2: Game Over (The New 52) est écrit par Greg Pakavec un total de 224 pages et publié par DC Comics le 2015-05-12. 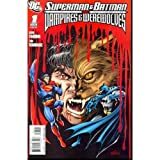 Superman & Batman Vs Vampires & Werewolves #1, 2, 3, 4, 5, 6 Complete Series Set est écrit par et publié par DC Comics le 2008. Superman/Batman vs. Aliens/Predator (2007) #2 (Superman and Batman Vs. Aliens and Predator (2007)) est écrit par Mark Schultzavec un total de 49 pages et publié par DC le February 16, 2017. The action-packed conclusion of the 2-issue mélee! An entire colony of Earth's deadliest enemies has hidden themselves away for centuries...but now they're poised to overtake the planet—unless Earth's most resourceful heroes can stop them! Co-published with Dark Horse Comics. Batman/Superman Volume 2: Game Over TP (The New 52) by Greg Pak (2015-05-21) est écrit par Greg Pak; et publié par DC Comics; 52nd edition edition (2015-05-21) le 1800. Batman/Superman Vol. 2: Game Over (The New 52) by Greg Pak (2015-05-12) est écrit par et publié par DC Comics; 52nd edition edition (2015-05-12) le 1800. Superman Batman TP Vol 01 Public Enemies by Ed McGuinness (Artist), Tim Sale (Artist), Jeph Loeb (2-Oct-2009) Paperback est écrit par Tim Sale (Artist), Jeph Loeb Ed McGuinness (Artist) et publié par DC Comics (2 Oct. 2009) le 1600. By Greg Pak - Batman/Superman Vol. 2: Game Over (The New 52) (52nd Edition) (2015-05-27) [Paperback] est écrit par Greg Pak et publié par DC Comics le 2015-05-27. DC Super Heroes Comics: Batman vs Superman Collection 3 Books Set (Batman vs Superman The Greatest Battles, Batman/Superman Volume 1: Cross World, Batman/Superman Volume 2: Game Over) by Various (2016-08-06) est écrit par Various et publié par DC Comic. Batman/Superman Volume 2: Game Over TP (The New 52) by Brett Booth (Artist), Jae Lee (Artist), Greg Pak (19-May-2015) Paperback est écrit par Jae Lee (Artist), Greg Pak Brett Booth (Artist) et publié par DC Comics; 52nd edition edition (21 May 2015) le 1600.